The Hoepker property consists of four parcels that total approximately 69 acres along Hoepker Road, between I 90/94/39 and Portage Road in the City of Madison. 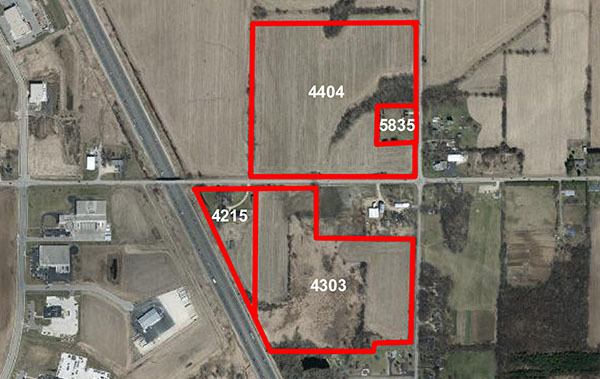 These four parcels are 4215 Hoepker Road, 4303 Hoepker Road, 4404 Hoepker Road and 5835 Portage Road. Each are priced separately, but may be purchased together or in any combination. These parcels are part of the Pumpkin Hollow Neighborhood Plan that was adopted by the City of Madison in 2008. The Pumpkin Hollow Neighborhood includes 2,192 acres of land. The general boundaries are I 90/94/39 to the west, State Hwy 19 to the north, Rattman Road to the east and the American Center to the south. It is intended to include single-family and multi-family residential areas of various densities as well as commercial areas. The Hoepker property is to include primarily multi-family sites and a commercial area at the corner of Portage Road and Hoepker Road. The areas located within the Hoepker land designated for residential uses include sites with densities of up to 16 units per acre in some areas and up to 40 units per acre in others. The commercial area is designated as Mixed Use Neighborhood Center. This designation is to include small retail or service retail and office space along with residential components. A grocery store would also be considered a compatible use.